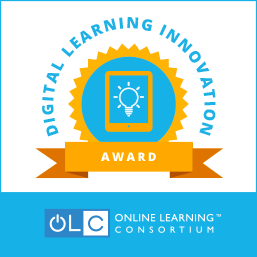 The 2018 class of DLIAward recipients demonstrated innovative approaches in addressing important challenges and barriers, including: improving student outcomes; altering instructional approach and pedagogy; minimizing costs of textbooks and tuition; targeting bottleneck courses; improving learning efficiency; enhancing student support; and decreasing time to course credit and degree completion. The following three institutions were awarded $100,000 for their innovative and creative programs, dedicated to accelerating the adoption of digital courseware for general education or gateway courses. Impact: As a result of the new approach, success rates among all enrolled students increased from 55% in AY15- 16 to 75% in AY16-17, and 79% in AY17-18. Success rates for underprepared students had an even more significant improvement of 28 percentage points from the previous year’s outcomes. Given that approximately 33% of the AY16-17 students would have been enrolled in developmental math course based on math placement test results, these gains validated the efficacy of the model. Comparing student completion rates in the course for Fall 2015 and 2016, we also found that more than 800 additional students were able to complete the newly designed course on their first attempt. For those students, successfully completing College Algebra their first semester allowed them to stay on track for degree completion. This is a critical first step to improving student retention rates and, consequently, graduation rates. Moreover, when we tracked the first AY16-17 cohort of students in the new approach through their next math course, we discovered that they were 7 percentage points more likely than previous cohorts to complete it successfully on their first attempt. This indicated that innovation was paying dividends for the students well after the first course. Pass rates went down in the QL course Quantitative Reasoning (QR) but went up in college algebra. However, the lower pass rates in the QR course were still higher than those observed in college algebra. Higher pass rate in QR along with increased enrollment resulted in sharp increases in QL completion rates in Summer 2016 and 2017, Fall 2016 and Spring 2017, compared to historical rates. QL rates increased by about 5-7% in these semesters. The proportion of students retained into a higher math course the following semester was markedly higher for the new gateway course (.44 in Fall 2016) than for Intermediate Algebra – the previous gateway course (.33 in Fall 2015 and .3 in Fall 2016). The Math Department implemented (Fall 2017) the ‘Mulligan Project’ which intrusively assisted students who scored below 73% on the first formative assessment in the ‘Algebra for College Success’ gateway course to QL. The initial results indicate students within [60,83] range in the initial assessment successfully completed the course and changed their study habits by seeking help prior to summative assessments. The following faculty-led teams were awarded $10,000 for their innovative and creative programs, dedicated to accelerating the adoption of digital courseware for general education or gateway courses. In spring 2017, synchronous, Randomized Control Trials (RCT) were conducted to beta-test the College’s mobile-responsive design. The project’s external evaluator, Dr. Matt Giani, designed the 15-week trials to meet or exceed “What Works Clearinghouse” standards. RCTs were implemented in Beginning Algebra I (Math 098), Beginning Algebra II (Math 099) and Developmental Writing (English 099) in 34 class sections and involved 980 students both at BPCC and Northwestern State University of Louisiana. Dr. Giani reported that use and access of the courseware significantly improved students’ outcomes for successful completion across all three courses (49). Dr. Giani reports, across the three courses, “students in the treatment group were roughly six percentage points more likely to have passed the course compared to students in the control group (61.6% vs. 55.7%).The treatment group also outperformed the control group in each of the three course numbers. The largest difference was in Math 99, where students in the treatment group were 8.9% more likely to have passed the course compared to the control group. The smallest difference was in Math 98, where treatment students were 4.3% more likely to have passed. For Engl 99, treatment students were 6.2% more likely to have passed the course” (Giani, 49). Impact: During the fall 2017 term, the first term that BioBeyond was piloted, the two sections offered saw a student success rate of 88%, which is defined as scoring a 60% or higher in the course. This is a 46% increase when compared to the average student success rate of 42% in courses not using BioBeyond. The summer 2018 term was the first term that BioBeyond was offered to all BIOL101 DE sections. Preliminary analysis shows a 28% increase in student success rates. Our summer term officially ends on August 1, at which time we will be able to review student retention rate in courses using BioBeyond versus previous courses with other course materials. Mohave Community College participated in a larger study to examine the final course grades awarded to students in sections that implemented BioBeyond versus sections that did not. Students in BioBeyond-enhanced sections at MCC ended the course with a +0.26 increase on a 4.0 grade point scale compared to counterparts in traditional sections. In the same study, it was reported that online students at Arizona State University had a +0.42 grade point increase and students at Miami Dade College showed a +0.46. Students in the action-based learning sections at MCC have since shown even greater improvements in terms of overall student success (increasing from 72% to 90%). Student scores tracked on identical exams over the course of six semesters have incrementally improved with each semester as the course format has moved further away from traditional lecture-based lessons to one built on answering the questions that engage and excite students. Impact: Expensive textbooks can be a barrier for all students. Most Historically Black College and Universities (HBCU) serve a large percentage of underrepresented students and low-income students. Norfolk State University, Barnes and Noble, and Cengage Learning collaborated on the computer science general education course with a specific focus on creating holistic solutions on eliminating the barrier of expensive textbook and the integration of digital courseware. The goal of the collaboration was to create learning without barriers for first-generation students and deliver all digital content directly and seamlessly to our institution’s Learning Management System (LMS) on the first day of class. With the implementation of the model, students saved between 33% and 68% on textbooks and course materials. Results have been encouraging, with pass rates increasing from 60% to 78%, homework scores jumping from 75% to 93%, and exam scores increasing from 70% to 89%. PCC students taking our complete basic algebra sequence have had textbook expenses reduced by over $200. At current enrollment levels, the student body is saving roughly $700,000 annually. ORCCA has embedded Interactive examples and video lessons. Students at the end of our sequence are using the same book as students at the beginning, so they are easily able to reference earlier material when needed. The low cost of the print book makes it something a student can feel comfortable annotating freely; there is no resale value to preserve. ORCCA is immediately available when the course begins and stays available throughout, regardless of financial aid status. The ORCCA eBook is born with functional and accessible pages, serving all users, including assistive technology and small screen users. Faculty are free to make the textbook content match precisely what we intend to teach. There will never be a missing topic (requiring a supplement packet), an extra topic (misleading adjunct faculty to teach more than we expect), or a topic handled with a pedagogical approach we are not comfortable with. The resources that we formerly put into periodic textbook searches will now be put toward refining and enhancing the book that we have. Faculty have already collaborated on in-class assessments, activities, and summative assessments. A significant curriculum revision is underway, made more possible by the flexibility of having our own book. The physics team created a set of 14 labs utilizing the IOLab across a two-semester laboratory sequence, which mirrors the content-specific student outcomes for residential labs. The at-home labs match the quality of the measurements taken, the analytical methods used to analyze data, and the LMS supports the communication modalities to bring students together to talk about their unique data sets and make sense of the weekly exercise. Students also explore unique features about their location and use the device to think as scientists to create answerable questions using the suite of onboard sensors and the software interface which communicates to the IOLab using a wireless USB radio transmitter. The impact of the innovation of writing custom IOLab exercises, which are displayed within the IOLab software, provides students with a tutorial style interface to work towards reaching milestones by answering in-line analysis questions while performing the activities and making sense of the data they are collecting. So it’s not just the tool that is the innovation that removes the barrier for offering physics labs, but how the tool is used to create a coherent student experience that supports student success at achieving the outcomes, while fostering a learning community eager to discuss and provide feedback on each other’s understanding. The impact of the IOLab is not the ability for students to complete at home data acquisition, but for students to have authentic conversations and experiences motivated by the high resolution of data that they each collect, while working collectively towards an understanding to achieve the student outcomes. Further, the skills practiced by students working with the IOLab match the traditional residential labs and conform to the American Association of Physics Teachers guidelines for outcomes of introductory labs. Survey results following the fall 2017 pilot of roughly 1,000 students revealed that 68.5% felt the courseware contributed to their success on major writing projects. Data also indicated that students used the courseware in various ways without being prompted, indicating the platform is versatile enough to accommodate individual student needs. Further, this open courseware has substantially reduced textbooks costs for our students. After our success with the pilot, the courseware has been implemented program-wide for the Fall 2018 semester, and our work is being used by at least two other schools.